Making people live longer could produce a population with healthy bodies but ‘stupid’ brains if scientists can’t work out how to stop dementia, an expert claims. Professor Mauro Giacca, a heart disease expert at King’s College London, said humans probably aren’t capable of living much longer than 120 years. And he believes it would be damaging for a 100-year life to become the norm if doctors can’t figure out how to stop brain degeneration. ‘We will increase the number of perfectly functioning bodies but with poorly functioning brains,’ he warned at a conference last week. Professor Giacca is an expert of cardiovascular science – that investigating heart and circulatory diseases. He made the speech at an event at the Francis Crick Institute, The Telegraph reported, and said it is still not understood why humans age the way they do. He said: ‘If there was a world where we were vaccinated and free of disease would we live forever? Absolutely not. ‘It is likely there is a biological clock which sets human life around 120 and we are programmed not to live longer than that. 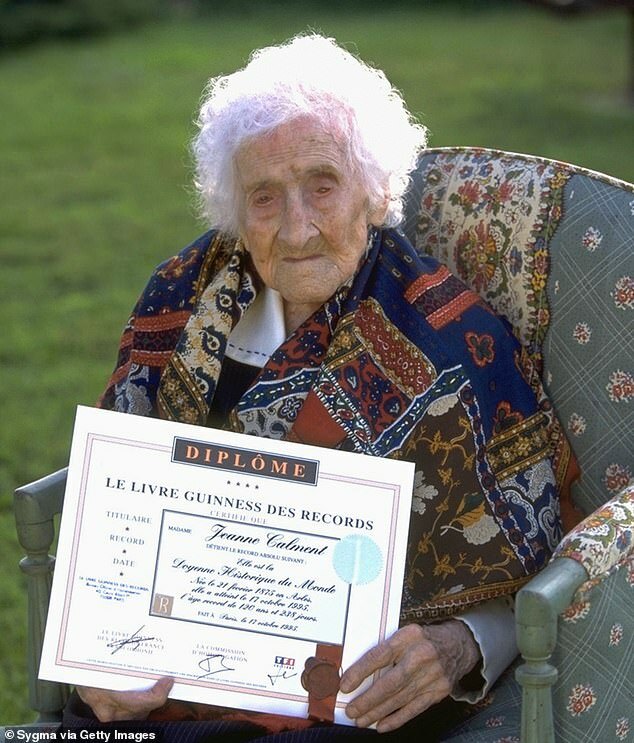 The oldest person ever to have lived – and had their life reliably recorded – was the Frenchwoman Jeanne Calment who died aged 122 in 1997. Living to be older than 100 is rare but becoming more common – the UN expects there to be 3.2 million centenarians worldwide by 2050, up from 316,600 in 2012. But rising at the same time is the prevalence of dementia – a condition in which the brain becomes damaged by age, causing memory loss, thinking and speech problems, difficulty understanding things and poor judgement. There 850,000 people in the UK with dementia and it’s expected to rise to a million before 2025. More than five million Americans have Alzheimer’s disease – the most common form of dementia. Various scientific theories attempt to explain why people decline as they get old. One is that of senescence, in which cells become useless over time but cannot be cleared by the body so linger and interrupt the body’s processes. Or the free radical theory, in which scientists believe cells make waste products as they use energy and these waste products build up in the body over time and become damaging. Whatever its cause, ageing is proven to degenerate the brain and, Professor Giacca warns, this is damaging enough over a normal lifetime without disease. He added: ‘A person who reaches 80 or 90 has already lost about 10 to 15 per cent of their brain, which is why they think and move more slowly. Life expectancy in Britain for both men and women has fallen by six months compared to last year, figures revealed last week. 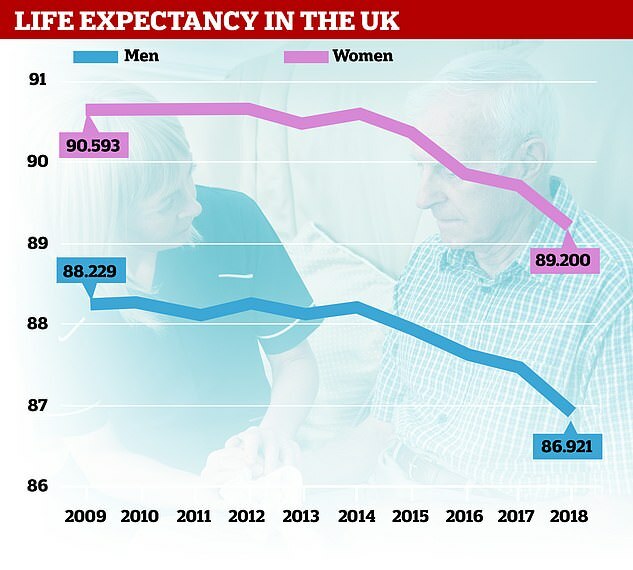 Statistics from the Institute of Faculty of Actuaries, which calculates life expectancy for pension providers, expects men to live until 86.9 years and women to 89.2 years. This is a drop from 87.4 years for men and 89.7 years for women in 2017, the projections reveal. The institute declined to speculate on exactly why the forecasts showed lower life expectancy, but experts have pointed to the impact of austerity, cuts to the NHS, and rising rates of dementia, diabetes and obesity. Tim Gordon, part of the institute and which carried out the study, said: ‘It’s now widely accepted that mortality improvements in the general population since 2011 have been much lower than in the earlier part of this century.